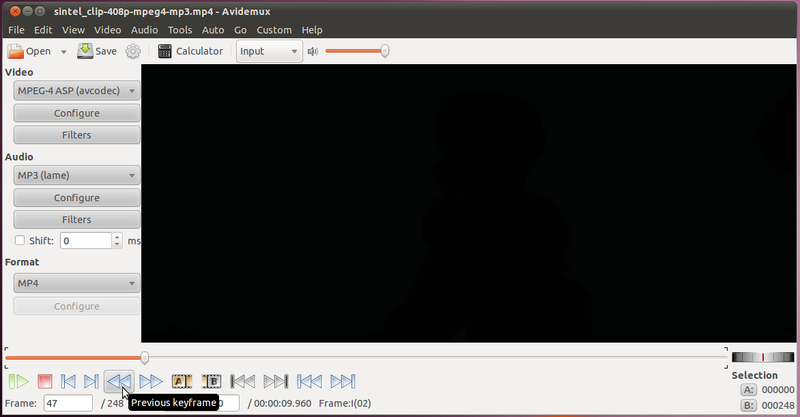 Avidemux is a very simple video editor and converter. Unlike handbrake or ffmpeg, it has only limited support for multiple channels of audio/video/subtitles. Also, its codec support is more limited than ffmpeg's (but it has more than handbrake). Additionally, it was originally written to work with files in the Microsoft Windows AVI format, because of this other formats/codecs do not work properly in special circumstances. Even though this is a simple tool, with some annoying errors, it is very useful for times when you have a clip of video and want to either remove a section from it, or take only a section of it and save it as a separate file. Starting with our clip from sintel, we're going to try out both of these simple operations. Next we'll set the encoding parameters from the drop-down menus on the left. We'll just MPEG-4 ASP (avcodec), MP3 (lame), and MP4. Whenever we click the save button, it will save our current selection (after asking us for a file name) by encoding the selection to this format. This can be a time-consuming process for large files, so it is possible to just set it to "copy", in which case it won't re-encode the video, however this can sometimes lead to errors. This will leave us on an entirely black screen. If we go back any further we will start to see the outline of the previous scene. Once we have the starting point, we can use the "next keyframe" button to advance to where we're not seeing black anymore, and again back-up so we have only the black screen. Once there, hit the button to mark the start of the selection. And we'll hit the button for the end of the selection. This will give us a selection of the whole clip. Now we can hit the save button, and specify the file that where we want to put the output. For our next exercise, we'll go and pick out just the video containing the old man and save that segment to a file. At this point we have the final frame on the screen and we can go ahead and hit the button to make this the end of our selection. Now that we have a selection of just the video that we want, we can hit the save button and select the filename we want to save the section as.